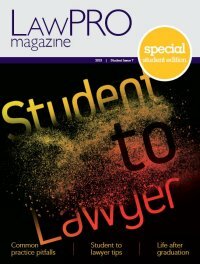 Make the transition from student to lawyer: The Student Issue of LAWPRO Magazine will help you embark on your career as a lawyer with articles on choosing the right job, the articling experience, interview tips and how to broaden your professional network. There is also claims prevention and cyber security advice that will serve you and your clients well throughout your career. Avoid malpractice claims: Did you know, four out of five lawyers will face a malpractice claim during the course of their career? Communication breakdowns and time management are the most common causes of claims, not mistakes of law. Check out the biggest malpractice claims risks article for an in-depth explanation of the most common causes of claims. Choosing to specialize in a practice area can help you succeed – take a look at the malpractice Claims Fact Sheets for a heads up on the top mistakes in your particular practice area. Navigate a courtroom for the first time: Going to court for the first time can be an intimidating experience, but it can become familiar with practice. Our cheat sheet can help you as a law student or lawyer approaching your first hearing with some know-how. When and how to report a potential claim: As noted above, most lawyers have at least one claim in their career. Facing a potential claim will be stressful, but LAWPRO is here to help. The majority of LAWPRO claims are resolved without an indemnity payment being made. For more, read this article on when and how to give notice of a claim to LAWPRO. Start your client relationship off right with a retainer: A well drafted retainer letter can get your relationship with a client off on a solid footing. This is important to help avoid issues later on. Take advantage of our retainer letter precedents which cover many areas of law. Improve client service: For ideas on how to improve your client service, check out our Managing the Lawyer/Client Relationship and Managing a Better Professional Services Firm booklets. Protect yourself against fraud and cybercrime: Lawyers are often the target of fraud, and new lawyers can be particularly vulnerable. Visit our Fraud Prevention page to learn more about the different types of frauds directed at lawyers, including bad cheque frauds. Our Cybercrime and Bad Cheque Scams Fraud Fact Sheet will help you spot the “red flags” that can indicate a matter is a fraud. You can get the latest fraud warnings from the Avoid a Claim blog. Maximize your use of technology: We offer a number of articles that will help you learn more about technology and how it can help you succeed in practice. Examples include Essential dos and don’ts for LinkedIn users and How to safely put your data in the cloud. Visit our Technology page for more tips and articles on using legal technology. Improve the finances of your practice with a budget and business plan: Keep your firm in good financial health with our Managing the Finances of Your Practice booklet, sample budget spreadsheet, and business plan outline. Maintain a healthy lifestyle: The Law Society’s Member Assistance Program offers law students and lawyers confidential counselling and resources to help with alcohol, drug or other addictions, stress, burnout, or mental illness. Also peruse our magazine on maintaining well-being, Finding Your Blue Sky. Learn more about management, marketing, finance and technology: Visit our practicePRO Lending Library where you can borrow, for free, more than 100 books on managing a law firm, marketing legal services, improving practices finances and making greater use of legal technology. Learn about the future of law and legal services: Learn more about the significant changes the legal profession is undergoing in The challenges and opportunities of practising law in a global village and Artificial intelligence and the ‘self-driving’ lawyer articles, and What is AI and will it really replace lawyers? Throughout your career, make practicePRO.ca a regular destination for helpful information on how to be a better lawyer, build a successful practice, and avoid malpractice claims. Our LAWPRO’s Best Claims Prevention Tools and Resources brochure has a full list or our most practical and helpful checklists, precedents and resources.